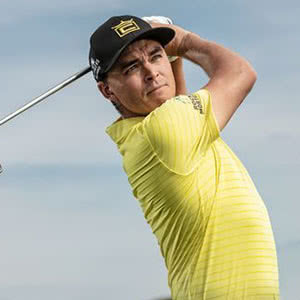 Despite his short professional career spanning back to just 2009, American Rickie Fowler has established himself as one of the world's best golfers as well as a firm favourite amongst fans and peers for his great attitude and admirable skills. Fowler is also increasingly well known for his quirky appearance on the course, joining Englishman Ian Poulter as one of the most colourful players in the world of golf. Born in December 1988 in Murrieta, California, Fowler’s golfing ability was restricted only to the driving range from an early age - where he taught himself the tricks of the trade. He posted an all-time course record of 62 at his home green during his freshman year in high school before leading his team to the state final in the SW League in 2007. During the same year, Fowler represented his country in their victory at the Walker Cup, as well as carding sensational wins at the Sunnehanna Amateur and the Players Amateur the following month. His first PGA Tour event as a professional came at the Justin Timberlake Shriners Hospitals for Children Open in 2009, where he managed a tie for seventh place, before coming in joint second at the Frys.com Open at Grayhawk Golf Club in Arizona. In December 2009 Fowler was able to gain his PGA Tour card after finishing T15 at Q-School. 2010 proved to be a stellar year for the young golfer, racking up second-place finishes at the Phoenix Open and Memorial Tournament, as well as being selected as a captain’s pick for his first Ryder Cup, becoming the youngest member of any U.S. team at the time. At the end of the year Fowler was awarded the 2010 Rookie of the Year, controversially beating out Northern Ireland’s Rory McIlroy. In October 2011 the popular player secured his first professional victory. Seeing off competition from then-world number two, McIlroy to sail to a six-shot victory at the Kolon Korea Open. Fowler carded a three-under-par closing round to finish on 16-under, despite consecutive bogeys on the last two holes at the Woo Jeong Hills Country Club. “It was a lot of fun. I played well early on in the final round and then I was comfortable over the last few holes. Overall, I enjoyed the whole week,” he said. Up next the 23-year-old hit headlines by taking the daring leap to change his preferred type of golf clubs in a bid to make improvements to his ever-evolving game. Saying goodbye to his Titleist driver, three-wood and irons four through nine, Fowler replaced them with Cobra’s AMP driver and three-wood, as well as AMP Pro RF prototype irons. Fowler’s next career win came in May 2012 at the Wells Fargo Championship, again beating McIlroy to gain his first PGA victory. The Cobra player’s golf game continued to gain steam throughout the 2014 season. With Fowler having his best major finish at the U.S. Open at Pinehurst No. 2 where he ended the tournament T2 with Eric Compton. Close calls at the majors continued during the season when Fowler again finished runner-up at the Open Championship and T3 at the PGA Championship.